I promised you more cherry recipes, and here is another one, a great one! 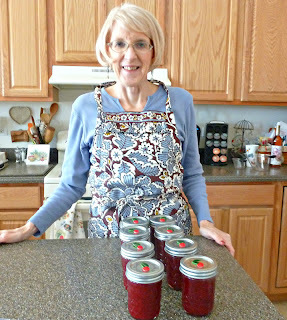 I made Door County Cherry Jam, jars of love, on President's Day, for the first time. I call them Jars of Love, because, you keep a few, but then you give them with love, to your friends. I had made pickles before, but never jam. These are the same kind of cherries that Scott uses for his Door County Cherry Rum Pie. Here I am in Carolyn's kitchen. Do you wear an apron? I made the jam with my friend, Carolyn, who, makes this jam frequently. 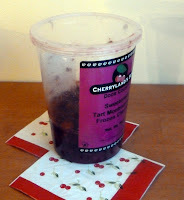 We were able to find frozen Door County Cherries at Woodman's, so I was so excited to get them. 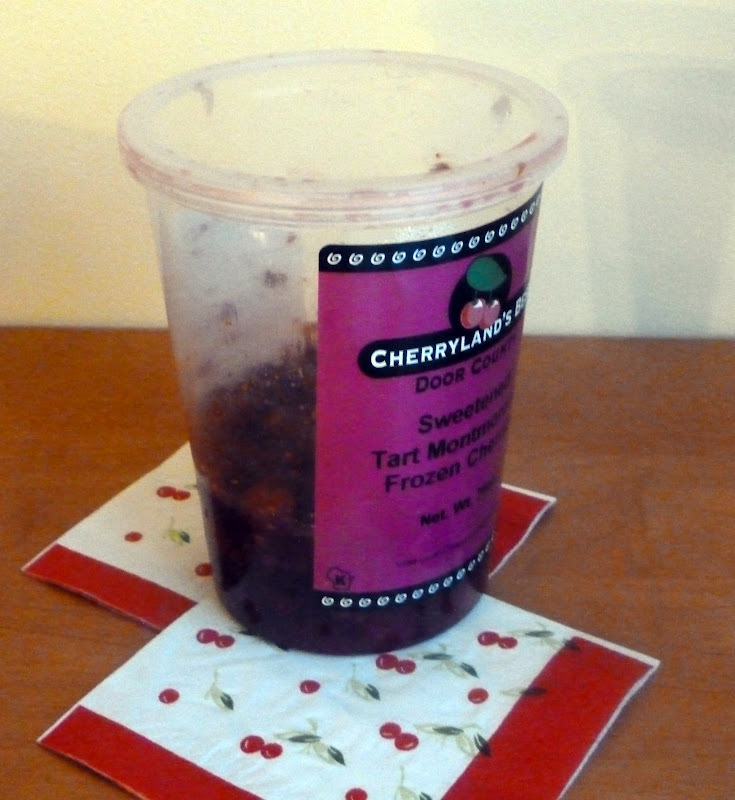 Then I bought some of those cute little jars, and the low sugar pectin, because these cherries were sweetened. Carolyn's granddaughters were with her for the day, so we had a crowd, but it was so much fun. 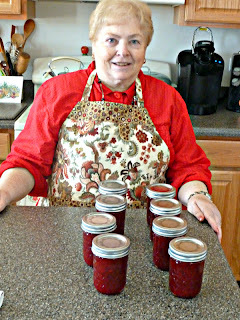 What a wonderful way for a Foodie to spend the day with friends, making Jars of Love. Thank you Carolyn, for showing me the way to make the jam:) Scott was so excited when he could open the first jar this morning, and have a Double Cherry Muffin, Cherry muffin with Cherry jam. What could be better?? Here is my friend Carolyn, in her kitchen. And here are Anna and Emma, Carolyn's Granddaughters with their Jars of Love. We used the low sugar pectin for this wonderful jam. Measure exact amount of sugar, 3 cups in a separate bowl . Mix 1/4 c sugar from measured amount, and and 1 box of Sure Jell for Less sugar in a small bowl. Stir pectin-sugar mixture into prepared fruit in sauce pan. Add butter to reduce foaming and lemon juice. Bring mixture to full rolling boil (a boil that doesn't stop bubbling when stirred) on high heat, stirring constantly. Stir in remaining sugar. Return to full rolling boil and boil exactly 1 min., stirring constantly. Remove from heat. Ladle immediately into prepared jars, filling to within 1/8 inch of tops. Wipe jar rims and threads. Cover with two-piece lids. Screw bands tightly, while pressing thumb down in middle of lid. We did not "can" this jam in a water bath. Turn jars upside down for 10 min, to help the jars seal. After 10 min., turn jars right side up and let cool for 24 hours. You should hear the lids pop, when they are completely sealed. Enjoy! I personally think that you can never have too many cherries. After reading this post as well as that pie link, I am glad you shared your tasty creations and are continuing on with the cherry fest. The pie is one I missed, thanks for linking that up. Wish I had one of your jars of love! Also, a kitchen project with friends and family does make for a great afternoon. 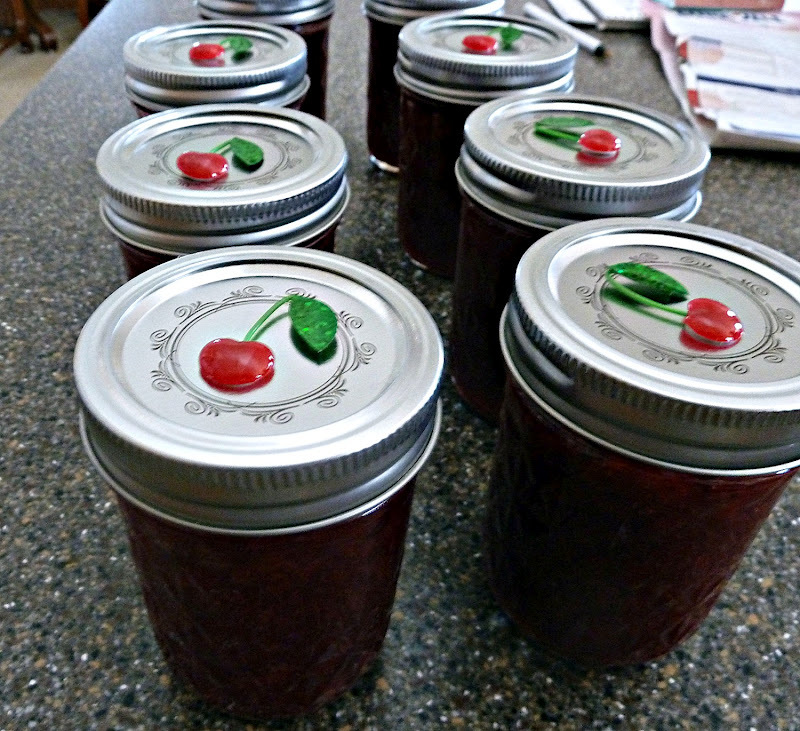 How delicious - cherry jam - I'd love some on a piece of toast with a cup of tea! This jam would be very good with a cup of tea and toast! I can see why you call this "love in a jar". So good... love it. I call them jars of love, because they are made with love, and you pass them on. It's so good! Aren't those just the cutest little helpers ever! Glad you had such a lovely day! Your jams and you look marvelous! Becky-I have never tried to make jams with frozen fruit. Didn't know you could...but then, why not? Yours turned out so pretty and absolutely sweet...just the right sweetness with the low-sugar. 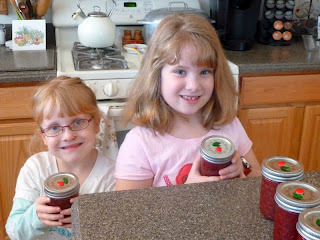 Thanks for sharing your recipe and the fun cute photos with your friend, and granddaughters! 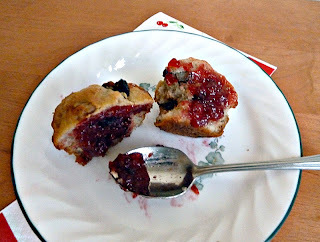 You buy the cherries frozen, and then defrost them to make the jam. The cherries are grown in Northern Wisconsin, so out of season, they are only available frozen. the jam did turn out well. Nice to meet you! Thank you for stopping by and being my newest follower. Door County Cherries are the best! My husband makes a wonderful Door County Rum Pie. The jam was fantastic Becky. 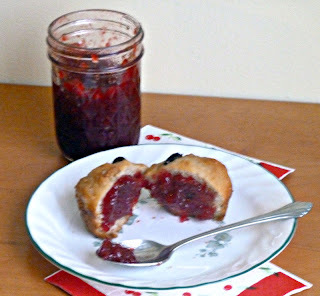 Just the right amount of sweetness, I prefer my jam with less sugar and this one is just right. Love those pics of you and Carolyn and her grand daughters. is it 4 or 5 cups of prepared cherries?? ?